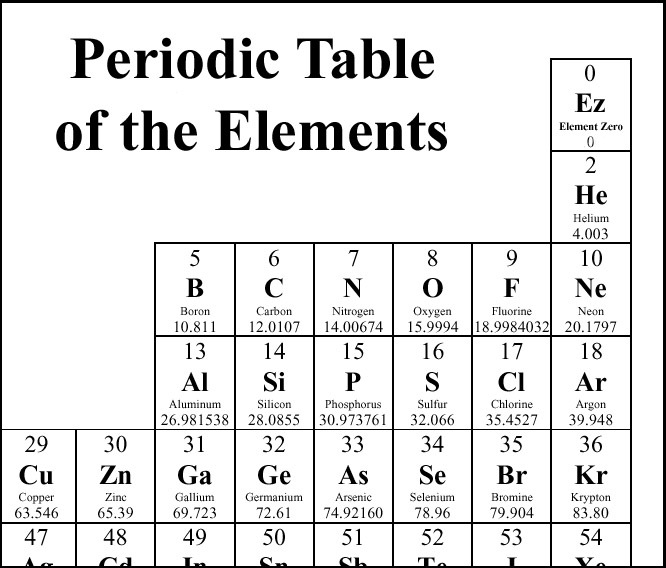 On the periodic table of elements, every element has a number corresponding to the number of protons in its nucleus. Hydrogen is #1, helium #2, and so forth. In the video game Mass Effect, scientists have discovered an element with no protons, making it #0. That’s an interesting idea, and certainly element zero has some qualities which make it a useful plot point, but what’s the difference between an atom with no protons and nothing? Almost a century ago, a real scientist named Andreas von Antropoff suggested adding an element zero to the periodic table. He called it neutronium, and it consisted of a single neutron with no proton and no electron cloud. Since neutronium wouldn’t interact with other elements, it would probably belong with the noble gases and be placed above helium. Nuetrons, when they’re alone, are unstable and tend to break apart into a proton and electron (and an electron antineutrino). So neutronium would rapidly decay into hydrogen. Also, unlike the element zero in the game, neutronium would have mass (preventing it from canceling out the mass of physical objects as described in the game). I suppose neutronium could be an unstable isotope of element zero. But then we’re still left with an atom with no proton, no electron cloud, and no neutrons. So what is it? Maybe the new Alpha Magnetic Spectrometer will figure it out. Posted by J.S. Pailly on May 19, 2011 in Uncategorized.